Orchard View Cottage is situated on 20 acres of private land which includes pasture, native bush, garden and riverside. The cottage overlooks the property with pine forest to the rear. 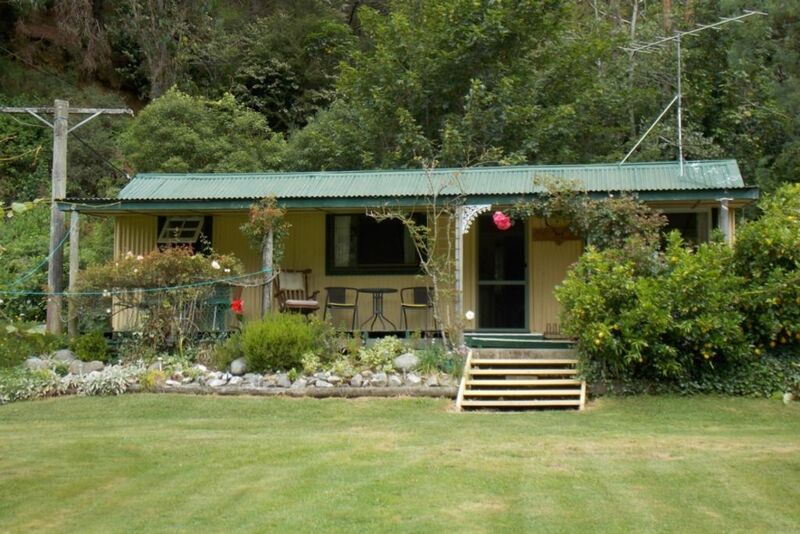 Well away from the road the cottage is ideally situated for families with children, trout fishermen (as the Riwaka River borders the property), and those people who just want to sit back and relax. Orchard View can sleep 4 people in 2 bedrooms and freshly laundered bed linen and towels are provided. A fifth guest can be accommodated on the sofa bed and a cot is available on request. The kitchen is equipped with electric stove, large fridge/freezer, microwave, toaster etc and in the living/dining area there is Sky TV and DVD player. The large deck which catches the sun all day is furnished with gas BBQ, tables and chairs for outdoor living. Here you can relax, enjoy the stunning views across the valley, listen to the abundance of native birdsong and watch the antics of the free range chickens. A three minute stroll will bring you to the riverside or feel free to explore the property and make friends with the animals which include dogs, cats, horses, llamas, free range hens, turkeys and ducks. There is plenty of native bird life such as the friendly wekas and fantails, kereru and kingfishers. Great for children and adults alike! The Riwaka Resurgence is where the northern branch of the Riwaka River emerges from the depths of the Takaka Hill and is a 10 minute drive or an easy 40 minute walk away from the cottage. It is also a perfect base from which to explore the beautiful Abel Tasman National Park or laze on the beaches of Kaiteriteri and Marahau which are all only 15 minutes away by car. A day trip 'over the hill' to Golden Bay is a must. Enjoy the scenery, which you might well recognise from the Lord of The Rings, as you travel up the Takaka Hill. Visit Harewoods Hole (the deepest vertical shaft in New Zealand), or stroll down the main street of Takaka, well recognised for its arts and crafts community where you will also find a good selection of restaurants and cafés. Complimentary free range eggs, tea, coffee and sugar are provided on arrival as are basic cleaning materials. Other provisions can be found in Motueka a 15 minute drive away. *A port-a-cot and high chair are available on request. *Prices are for up to 4 people. An additional charge of $15 per night will be made for each extra person. *All school and public holidays charged at the high season rate of $145 per night. *Smoking outside only thank you. Well behaved pets allowed with prior notice when accompanied by responsible owners. Mobile coverage is not guaranteed. Guests are welcome to use the phone in the cottage for local and urgent calls. Farm and domestic animals on site include dogs, cats, chickens, ducks, geese, horses and llamas. Overlooking pasture and gardens with pine forest to the rear. The hosts were great and most interesting. There are a zillion chickens which are fun to watch and totally quiet at night. There are lamas, horses, ponies. The geese were fun watch wandering around. At night there is no traffic and no noise. Great for sleeping. We had meals on the porch watching the menagerie. The cottage was clean with a very well equipped kitchen which included fresh eggs. This is the best batch we have ever stayed in. It was like home-from-home. Comfy, clean, spacious with great TV. Facilities were great too - really good shower. Loved the chooks, llamas, geese, ducks, even the weka. Abbey (dog) was adorable. Great hosts. There’s free wifi available in the car park at Motueka and lots of cafes, if needed. It was a brilliant stay and we were really sad to leave. Good location for various day trips in the Nelson area. True "kiwi bach" character - eclectic with lots of thoughtful items provided for our convenience. Clean and comfortable. Friendly and obliging hosts. Would happily stay here again. Perfect! Had everything we needed, comfy and cozy. Absolute best family holiday ever - the cosy cottage is very well equipped and clean with a great shower and comfy beds. We loved all the animals - the weka roaming about the cottage, the chickens, geese and ducks and the lovely dogs who enjoyed playing with our kids at the river. It was so nice to head back from a day at the beach to this patch of paradise, bbq some dinner and swim in the river before bed! Thanks Kate and Len for sharing this wonderful spot - we very much hope to return. We had a lovely stay. Everything is within a short drive. We enjoyed listening to the chooks, laying out on the lawn and meeting the Weka. Having cable TV was a bonus. We ate at Simply Indian in Motueka one night and it was so good! A short drive or a 45 minute walk will bring you to the Riwaka Resurgence and Crystal Pool.The Resurgence is where the northern branch of the Riwaka River emerges from the depths of the Takaka Hill and starts its final 15km or so journey to the sea. The water constantly spilling into the light of day has run within limestone cracks and passages from around the top of the hill, and it comes out just as pure as the crystal clear waters of the better known Pupu Springs. The Abel Tasman National Park is a wilderness reserve at the north end of New Zealand’s South Island. It’s known for the Abel Tasman Coast Track, a long trail winding over beaches and across ridges between Marahau in the south and Wainui in the north. The headland at Separation Point is home to New Zealand fur seal colonies. Little blue penguins, bottlenose dolphins and seals inhabit the Tonga Island Marine Reserve. The entrance to the Park at Marahau is a 15-20 minute drive away from the cottage.